Elderflower Champagne is a popular, free hedgerow favourite. This elderflower champagne recipe was given to us by a retired chef. The original recipe made something like 6 gallons so we’ve altered it to a more domestic scale! Makes about 10 pints. 10 elderflower heads – (if you pick flowers in the morning they should smell slightly of bananas, if picked in the afternoon/evening there will be an aroma of cats piddle! Both work, but bananas are best ) Avoid picking from busy roadsides as the flowers may be tainted with vehicle exhaust. Pick the elder flowers when fully out and shake to remove insects. Place the flowers in a cloth bag. Heat half the water and add to the sugar in a brewing bin, stir until dissolved and then add the rest of the water. Add the vinegar, lemon juice and zest. Stir to mix and then immerse the bag of flowers in the bin. Remove bag of flowers & strain into strong glass bottles (use screw top bottles or the bottles with a wired removable stopper such as Grolsch ) and leave in cool larder for 2 weeks, releasing the fizz every couple of days or the bottles will burst. Serve very chilled, optionally with a slice of lemon and a sprig of mint for a subtle refreshing drink. It will store in a cool dark place for some months but do remember to check frequently in case pressure is building up from the fermentation. Unreleased, the gas build up can cause the bottles to explode. There are many variants on traditional elderflower champagne recipes. In this one keeping the elderflower heads in a muslin or cloth bag makes straining far easier whilst still allowing the flavour to infuse. 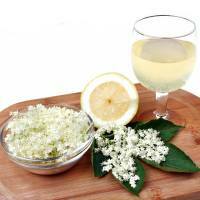 You can use this elderflower champagne recipe as the basis of an elderflower cordial. Take the mixture before bottling and add about a pound of sugar per pint. Boil to reduce the mixture by half and bottle or freeze as ice cubes. Mix with soda water for a refreshing drink.